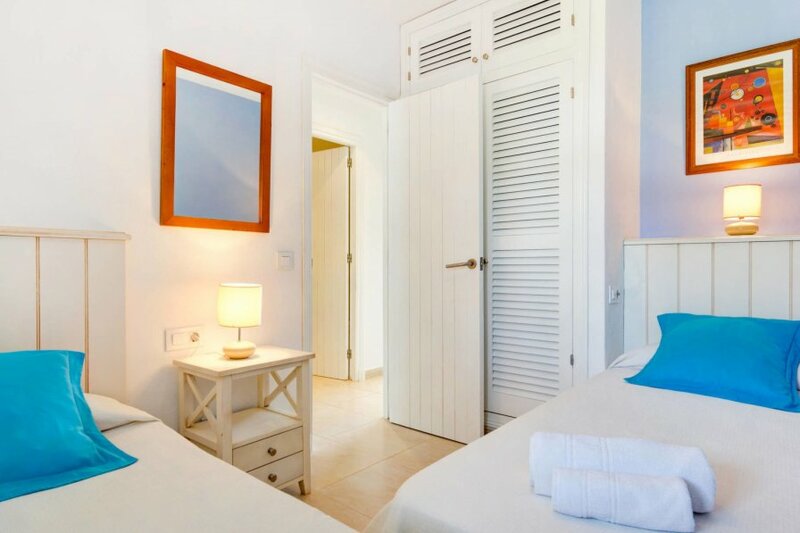 This 2-bedroom villa for up to 4 guests is located in Son Bou, Menorca and has a private swimming pool. Estate (shared use with holiday guests): with plants, with garden, well-kept, lawn, palm trees. Pool (shared use): 15.0 x 10.0 m, open throughout the entire season, curved shape, children's pool. Pool area: sun loungers (payment), external shower. Plot description: terrace 8 m2 (partially roofed), balcony 3 m2 (roofed), furnishing provided. Center Son Bou in approx. 600 m - 900 m. Alaior in approx. 7 km. Mahon in approx. 20 km. Next supermarket in approx. 250 m.
Airport Mahon in approx. 20 km. Sea in approx. 250 m. Sandy beach (via footpath) in approx. 400 m - 700 m.
apartment, 4 people, 3 room/s, 2 bedroom/s, 1 bathroom/s, approx. 45 m2, 1 floor/s, apartment on ground floor or floor 1. Please note: Non-smoking house. Kitchen: in the living room. Kitchen/ cooking equipment: 2 ceramic hobs, oven, microwave oven, combination fridge-freezer, water boiler, toaster.